I was poking around for interesting Portal 2 maps to play, and instead found an entire mod that replaces the portal gun with a gun that shoots the blue and orange gel from Portal 2. Even better, it has an entire storyline with a new character. Aperture Tag is a mod inspired by Tag: The Power Of Paint, the student game which eventually became the gels in Portal 2. If you're like me, when you played Portal 2, you covered every room in as much bouncy gel as possible. Well now it's a whole lot easier, and you can color coordinate the walls with orange gel. Motanum had already been designing maps for Source games, so when the "Perpetual Testing Initiative" was released, a Valve employee got in touch with him. He asked if they had any interest in making a paint gun. When the answer was no, he decided to do it himself. The mod itself is 26 levels, which Motanum describes as "like a Portal 2 DLC". I played through a few of them and I can't wait to finish them. Thinking with paint is a whole lot different than thinking with portals, and I think I might be too used to just looking for the white panels. But one thing is for sure: covering a level in gels never gets old. Why a mod and not a map pack? A mod offers me more freedom. I can change the menu, viewmodel, etc. And it makes developing this much more easier. In case you're wondering about price, Motanum doesn't know if he'll charge for the mod. From what I've seen it's definitely worth a couple bucks, but he's considering releasing it for free. Either way, he says he'll be releasing the source files he created so that people can build their own Tag levels. 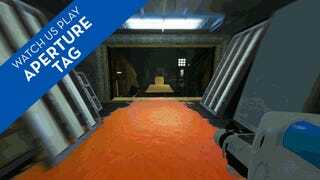 Go vote on Aperture Tag here on Greenlight here!